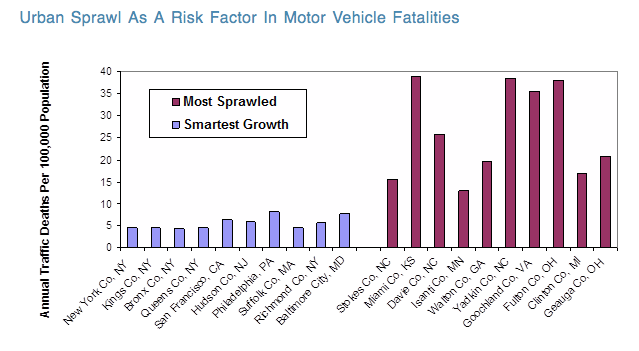 Why Is America Falling Farther Behind Other Nations on Street Safety? Vox, the much-anticipated Ezra Klein/Matt Yglesias/Melissa Bell reporting venture, launched earlier this week to wide fanfare, and one of the first articles explained that “traffic deaths are way, way down” in the United States. It was exciting to see Vox show an interest in street safety, but writer Susannah Locke missed the mark with her take on the issue. Locke called a decades-long reduction in traffic deaths to 33,561 in 2012 “a major public health victory.” What we’re talking about here is that only 11 of every 100,000 Americans were killed in traffic that year, which, she rightly points out, is a dramatic improvement compared to the 1970s, when the fatality rate was 27 per 100,000 people. But compared to our international peers, the United States is still doing a poor job of reducing traffic deaths. Rather than hailing the decline in traffic fatalities in America, we should be asking why we continue to fall behind other countries when it comes to keeping people safe on our streets. Americans are killed by traffic at an appalling rate compared to residents of peer nations, as shown in a review of dozens of countries by the International Traffic Safety Data and Analysis Group [PDF]. In Japan, the traffic fatality rate is much lower — 4.3 deaths per 100,000 people in 2011. In Germany, the rate is 4.9 per 100,000. In Sweden, 3.4 per 100,000. And in the United Kingdom, just 3.1. If the United States had a comparable street safety record, tens of thousands of lives would be saved each year. What’s shocking is not only that those countries have much lower rates of traffic deaths — it’s that they’ve also reduced those rates at a much more effective clip than the United States. The streets of our peer countries are becoming safer, faster. In Japan, the traffic death rate fell 47 percent between 2000 and 2011. Sweden’s fell 49 percent, Germany’s 46 percent, and the UK’s 49 percent. In the same time frame, the improvement in America was just 30 percent. Only developing countries like Malaysia, South Africa, and Colombia performed worse in the international review. Todd Litman of the Victoria Transport Policy Institute would refer to the diverging diamond as the “old transportation safety paradigm.” Litman points out in a recent piece on Planetizen that even as deaths per mile driven declined in the last 50 years in the U.S., increases in per capita driving eroded much of the safety benefit. In addition, safety fixes aimed at reducing the risks of driving — like airbags — also sometimes have the unintended effect of promoting riskier behavior. The factors Locke cites to explain America’s declining traffic death rate mostly fall under the rubric of “conventional traffic safety programs” — more seatbelt wearing, better airbags, anti-lock brakes, and less drunk driving. This is where looking abroad really would have helped, because the range of tactics that other countries have deployed is much broader. In the UK, 20 mph zones have been steadily growing since the turn of the century, and automated traffic enforcement is saving lives. The Dutch abandoned a street design philosophy based on “forgiving” errant drivers (which America embraced), shifting to an emphasis on walkable, bikeable streets. Japan has perhaps the world’s best transit networks, making driving less necessary. Germany is a pioneer in traffic-calming street design. Sweden, as the Economist recently reported, cut pedestrian fatalities in half over the last five years with a strategy that included low speed limits in urban areas and building 12,600 safer street crossings. These solutions are catching on in some U.S. cities. New York is rolling out 20 mph zones in some neighborhoods and has re-engineered wide streets to make biking and walking safer. Chicago and DC have substantial speed camera programs in addition to growing networks of protected bike lanes. 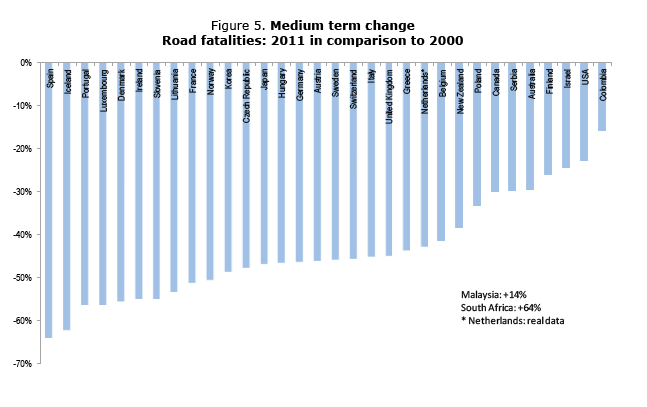 What impact are these changes having on traffic fatalities? How many lives could be saved if we scaled up these safety improvements nationwide? What else can we learn from countries that are leading the way in preventing traffic deaths? Those are Vox stories I’d like to read. It seems pretty obvious to me that a complete lack of driver training in the US has to be the major reason it differs so substantially from Europe and Japan. Here in the Netherlands, besides low speed limits (enforced strictly and aggressively by passive speed cameras) and traffic calming implementations in small towns and villages, drivers are also required to take approximately one full year of driver training (classroom and in-car) before they receive their license. Compared to the cursory 1 mile road test a 16 year old American is often taking to get their license, this results in a vastly better understanding of not just traffic laws, but also car control and driver behavior/reactions in traffic (merging, panic stops, poor conditions). The reality is that I feel safer riding my bike here than I do driving a car in the US! Reminds me of the old taunt, “Where did you get your license? In a box of corn flakes?” Many years ago I interviewed an official at the German Consulate General (so long ago it was West Germany) in San Francisco, because of stories I’d heard about how much more rigorous driver licensing was “over there”. The official told me how instructors had to be licensed, and if too many of an instructor’s “alumni” were responsible for collisions or received citations, the instructor’s license would be lifted. He went on to say that cars had to be inspected periodically, a process that would take two days, wasn’t cheap and was thorough. Even “cosmetic” body damage had to be properly repaired–no primer splotches. Modifications were strictly regulated–no “hot rods” or “low riders” allowed on the streets. To sum it up, driving was taken a lot more seriously there. I love the 20 MPH zone ideas. They might be a bit tougher to implement in a lot of American cities, because generally our self-contained neighborhoods are also our most sprawling, whereas our most compact neighborhoods tend to be more fully-integrated into a street grid. But that’s also further cause to do something like this, as oftentimes drivers will cut through side streets at speeds like they’re still on the main roads, endangering not only themselves but anyone else on the road or near it as they come on through. US streets can go a long way in improving the streets with practically no infrastructure improvements needed! All that needs to happen is for drivers to drive the posted speed. It’s real simple, you slow down the cars and you improve the driver’s reaction time and increase the ability to improve the drivers time to process information. This can happen by starting to ticket and take seriously speeding. Anything over 5 mph of the posted speed will receive a ticket. All without any traffic infrastructure improvement you have made the streets safer for all! I live on a Blvd that has a posted speed of 30 mph. The only ones going 30 mph are the garbage trucks and somewhat the buses! The average speed for the most part is 40-45! All well and good, but there is a HUGE gap in this story. What is the result when measured by vehicle miles traveled, not by per capita? You should, if you wish to have all the relevant facts. If the US has 50 killed out of 10,000 people and the UK has 25 killed out of 10,000 people, that’s double for the US. If the US has 25 killed out of 10,000 miles driven and the UK has 50 killed out of 10,000 miles driven, that’s half for the US. While both could be relevant, the per miles driven can be more indicative of problems. I’m with Ben. What is the relevance? That’s a straw man argument. Five fatal collisions in a year on the way to the same corner market five blocks away is not the same as five fatal collisions commuting 50 miles through Los Angeles twice daily, when the object of exercise is to gauge driving safety. The first says that something is dreadfully wrong with drivers or roads between here and the market. The second is just as tragic to the families, but not indicative of something dreadfully wrong with Los Angeles drivers or roads. Equal per capita, but vastly different per mile driven. One problem might be that we drive so much that even though our roads are safer per mile, they still manage to be more deadly per capita. That’s risk-overcompensation. Shhhh! Don’t let LADOT know or they will try to raise the speed limit of your street to that level. That’s the stupidest thing too. Raising the speed limit cause you (LADOT) failed to govern traffic. Sure would be nice if you could do this for YOUR work huh? Make a failing act an OK act. More than 40,000 Americans were killed in traffic last year, according to new estimates from the National Safety Council, the worst toll in a decade. The U.S. transportation system claims far more lives each year than peer countries. If America achieved the same fatality rate as the UK, more than 30,000 lives would be saved each year. There are lots of reasons. But a new report makes one thing is clear: Our safety laws are much weaker than peer nations.